The Landing Pages report in Display Advertising shows all landings which the analyzed ads lead to. You can run this report on an advertiser to see all of their ad campaign's landing pages on their domain or on a publisher to see all of the landings from that publisher's advertisers. If you select "advertiser" this report shows the landing pages on the advertisers site that they are trying to drive traffic to. If you select "publisher" this report shows the landing pages from all of the advertisers that ran ads on the queried publishing site. 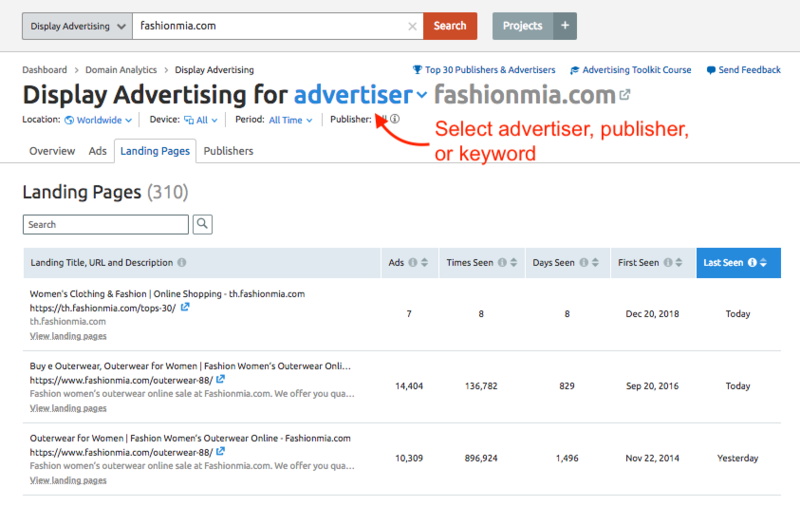 Select "keyword" to open a Display Advertising keyword report showing the ads related to your search term. You can view the landings descriptions by hovering over them. For your convenience, the landings are grouped by URLs. Ads – the total number of ads pointing to a given landing page. Times seen – number of times we saw ads leading to a given landing page. Days seen – number of days we saw ads leading to a given landing page. First seen – date when we have seen ads leading to a given landing page for the first time. Last seen – date when we have seen ads leading to a given landing page for the last time. How Does SEMrush Gather Display Advertising Data?